Scuba divers descending to the BVI Art Reef off the British Virgin Islands may encounter schools of snapper, sea turtles and rays. But they will certainly see something not native: a giant sculpture of a mythic kraken gripping a shipwreck. The arty artificial reef is part of a wave of new underwater installations visible to divers and snorkelers. Anchoring sculptures on sandy ocean floors, these cultural attractions have a scientific double life, providing habitats for fish, invertebrates and coral. “Coral reefs are often called the rain forests of the ocean because they harbor so much biodiversity,” said Duane Silverstein, the executive director of Seacology, a nonprofit that works to restore marine ecosystems, often by building artificial reefs. According to the Coral Reef Alliance, a conservation group, reefs occupy about one percent of the oceans but are responsible for 25 percent of marine life. Yet by 2050, experts say that all corals will be threatened because of overfishing, pollution, habitat destruction and more. It is a decline that the creators of artificial reefs aim to reverse. Natural or artificial, reefs provide marine life food, breeding opportunities and protection from predators. Artificial reefs, which are considered beneficial if constructed of materials that won’t harm the environment and placed for minimal impact on their surroundings, range from porcelain anchors to former naval vessels. From sunken ships and museums to submarine accommodations, underwater installations are proliferating. In November, the new Conrad Maldives Rangali Island resort in the Maldives will debut an undersea suite where the bedroom, living area and bathroom are in glass chambers resting on the ocean floor. 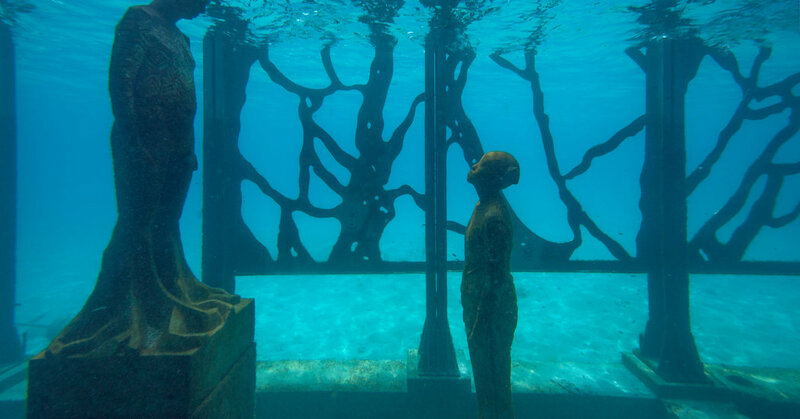 In July, Neptune Memorial Reef, an Atlantis-themed underwater crematory off the coast of Key Biscayne, Fla., expanded to accommodate the ashes of 4,000 more individuals over the existing 1,500 inset into the seascape of columns and statues. A few artists have made the aquatic environment their medium, including Jason deCaires Taylor who created the first underwater sculpture park in Grenada in 2006 as a means to draw snorkeling traffic away from the island’s overcrowded natural reefs. He has since cast nearly 1,000 marine sculptures, many found in art reefs off the coast of Cancún and the Bahamas. “It’s not a solution to the problems oceans are facing, but on a micro local scale it can encourage lots of marine life to settle,” Mr. deCaires Taylor said, identifying climate change, ocean heating and pollution as persistent threats. “But we can use it to talk about these issues and change people’s relationship to the sea, to think of it as a precious or sacred place and a unique habitat, rather than out of sight, out of mind,” he added. The following new artificial reefs combine culture and conservation. In 60-foot seas off Virgin Gorda, the many tentacles of a kraken grip an actual World War II era ship, a survivor of Pearl Harbor, in the BVI Art Reef. Installed in April 2017, the subaquatic sci-fi fantasy was created by a group of entrepreneurs, including Richard Branson, as both a habitat for marine life and a platform to generate local interest in ocean conservation. “We wanted to create fun, safe, exciting, Disney-like dives that could also support marine science,” said Aydika James, a co-owner of Secret Samurai Productions, which built the sculpture. It managed to avoid damage during Hurricane Irma last fall. But a storm in March moved the entire structure 30 feet and beheaded the creature. Nonetheless, the installation has newly attracted sea life and coral growth. “You can tell it was some kind of crazy creature attacking the ship and maybe the ship beat the creature,” Ms. James said. Several dive operators visiting the reef, including Dive BVI (trips from $95; divebvi.com), earmark a portion of the fee to fund swim lessons for local children. Mr. deCaires Taylor, who is based in London, has done many underwater sculpture projects. But none were as ambitious as the Coralarium, which debuted in July at the Fairmont Maldives Sirru Fen Fushi in the Maldives islands. Half-submerged in about nine feet of water, the cube-shaped art gallery features sculptures of human figures modeled on local islanders installed both atop it and within it. Staff marine biologists guide snorkeling tours among the art and coral plantings. The Coralarium is open only to guests of the resort, where rates start at $755 (Fairmont-maldives.com). Before undertaking the Coralarium, Mr. deCaires Taylor designed the Museo Atlántico, which opened in 2016 off Lanzarote in the Canary Islands. The museum, which will eventually include 300 sculptures, aims to create a fertile marine habitat with art that addresses social issues. A sculpture of a forlorn group of people in a raft, for example, references the current refugee crisis. The artist’s first cold-water installation introduced him to abundant sea life and, at 40- to 50-foot depths, a cobalt blue palette. Dive College Lanzarote offers excursions to the museum (from 55 euros; or about $64; underwatermuseumlanzarote.com). Seven sculptures, including an oversized pineapple and human skull, comprise the new Underwater Museum of Art, in 50 to 60 feet of water one nautical mile off the panhandle of Florida in coastal South Walton. The aquatic sculpture park, which opened in June, is a collaboration between the Cultural Arts Alliance of Walton County and South Walton Artificial Reef Association. In the aftermath of the Deepwater Horizon oil spill in the Gulf of Mexico in 2010, Mr. McAlexander created the nonprofit reef association to advance awareness of ocean vulnerability. The group has built four snorkel reefs shaped like turtles, dolphins and other sea creatures 250 yards off the beaches of South Walton. Visitors can reach the museum through Panama City Diving, which offers trips at $150 a person, excluding dive gear (panamacitydiving.com).